These behaviors should not happen during introductions. prevent these behaviors from happening at any time. Here are video examples of aggressive behaviors between pet rats. These can be difficult to find since none are ever scripted deliberately. For anyone wishing to successfully introduce new and current rats into a larger mischief, it can be very helpful to know what aggression between rats looks like for the specific purpose of preventing it from happening at all. One can observe the lead-up behaviors or triggers, and how a given behavior plays out. By becoming familiar with these behaviors through watching videos, you can have increased confidence when you first allow two rats to meet and your gloved hand is at the ready to stop any of these from occurring. Aggressive Rat Behaviors: Nose-offs, hissing, and belly-ups. An accidental encounter led Karen Borga to meet and film some rats that had just been caged together for transport. The owner reported the rats were in fact cagemates, but the behaviors we see, of nose-offs, hissing, and belly-up, are nevertheless examples of aggression between rats. This video provides an example of what not to allow to happen between new and current rats that a human is attempting to formally introduce. Gwen shares that watching this video is quite painful because the rats are frozen for so long with aggression and fear. "I just never want any of my rats to go through this. I know many people think aggression is not a big deal because it's the nature of rats, but we put our domesticated rats in artificial environments and try to group them on our terms or schedule. The rats can't adapt to each other in a normal healthy way and instead become overwhelmed. Myself, I will go out of my way to structure encounters and living arrangements that insure this kind of aggression never takes place or happens only accidentally. I don't want the rats I love to hurt so much. And I feel these rats are hurting, they are definitely hurting." Many people do allow these behaviors during introductions, but the suggestion is to intervene and (1) not allow them to start in the first place, and (2) if they do erupt, halt them right away by separating the rats. For both of these, using a gloved hand will gently protect both rats and humans. The method recommended is to gently structure the meetings between rats so that the outcome is pleasant, calm, and enjoyable. This helps the rats cement a sense of "nice other rat, not bad". When repeated, this builds a more stable, long-lasting, good relationship between the rats. When aggression is permitted, adrenaline is up, fear mounts, and injuries may result. These accumulate into negative associations between the rats. Allowed to continue over time, not only may the rats be injured, but the outcome may be failure to successfully introduce the rats. Many people take the risk and allow these aggressive behaviors, and are successful with the introductions. But if there might be a problem, why risk it? Why put the rats through unnecessary stress and suffering? "Nose-off: Two rats stand immobile, facing each other. The rats may have all four paws on the ground, or may have one or both front paws up (in which case a nose-off may segue into boxing). Sometimes one rat leans in toward the other while the second rat leans away from him (the rat who leans in is usually the dominant rat). Generally, the closer the rats are to each other, the more intense the encounter. The nose-off may be accompanied with the open-mouth tooth display from the subordinate rat. Nose-offs are a defensive strategy: as long as the subordinate rat maintains whisker-to-whisker contact, the dominant rat cannot bite him. Nose-offs may escalate into boxing. The dominant rat may respond to the nose-off or boxing tactics with a sidle (Blanchard et al. 1977)." "Hiss: Vocalization made during escalated agonistic encounters, typically when rats are very close to or in contact with each other. 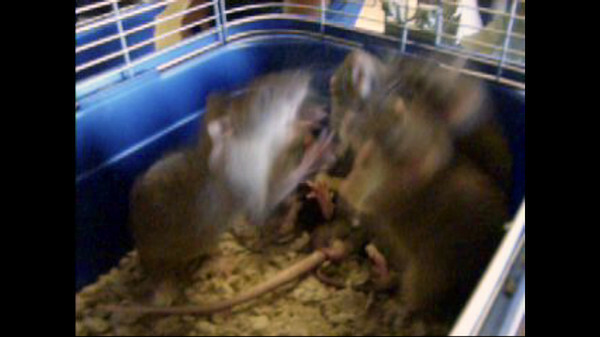 Such escalated conflicts tend to occur when the rats are confined and cannot escape each other, as escape takes precedence over fighting and hissing. Hisses tend to last about 1 second and have no discrete beginning or end, which makes identification of the hissing rat difficult...."
"Belly-up roll (pin): Juvenile-type defense tactic in which one rat rolls onto his back before another, sometimes after receiving a nip or bite on the rump. The top rat may then step on the supine rat, sometimes orienting himself perpendicular to the long axis of the supine rat (thus avoiding the whiskers), and pinning him down. The top rat may groom the supine rat's belly (see also belly-groom, or "power groom"), perhaps as an attempt to gain access to the nape or rump. Rolling on one's back tends to prevent further attack for several reasons: play fighting is directed at the nape, and serious offensive bites are directed at the lower back and flanks, so a roll hides these areas. Also, the rolled rat becomes motionless, and motion is an important stimulus for attack (Thor et al. 1981). Lastly, the recumbent rat may track his opponent's face with his teeth and whiskers, which may actively inhibit attacks as well (Blanchard and Blanchard 1977). So, the belly-up roll is probably not a signal of submission or defeat that inhibits further attack, because the attacker may continue to press his attack. The belly-up roll is instead a defensive strategy: the subordinate rat can escape being bitten insofar as he can interpose his belly between the attacker and his own vulnerable target areas of rump and nape."